Decided to give this one a go, too. Going for Level 1 on this one. Sign up here. Seriously addicted. But I'm sure I can do them all. 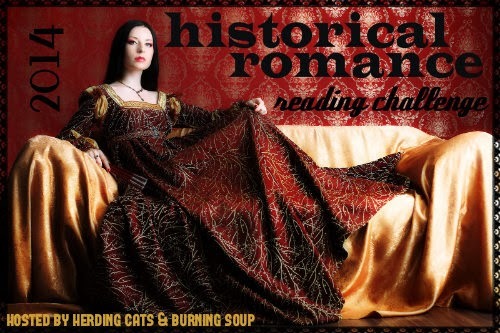 The goal is to read at least 12 Historical Romance! **Note** I'll be adding a check list of ideas (historical romance w/ arranged marriage, w/enemies to lovers, w/ older heroine, younger hero, etc for those that would like to use that. Any time period prior to 1920 qualifies. They can be historical paranormal, historical erotica, m/m, f/f, etc. If you'd like to be part of the FB group for the challenge join HERE. My favorite romance sub-genre is romantic suspense. I can’t get enough of the genre and I’m always looking for new authors and books to read. And here’s your chance to join me. Runs January 1, 2014 – December 31, 2014 (books read prior to 1/1/2014 do not count towards the challenge). You can join anytime before 9/30/2014. Sign up on The Book Vixen’s blog. The goal is to read 10 romantic suspense novels. To join the challenge, grab the 2014 Romantic Suspense Reading Challenge button and post this reading challenge on your blog to track your progress. Please include a link back to this sign-up post so others can join the reading challenge too. You do not have to be a book blogger to participate; you can track your progress on Goodreads, LibraryThing, BookLikes, Libib, etc., so as long as you have adedicated shelf for the 2014 Romantic Suspense Reading Challenge and your profile is not private. The point of linking up is to have a place where people can see what you’re reading.